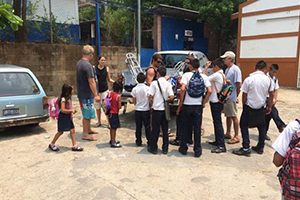 In April, the University of St. Augustine for Health Sciences Doctor of Physical Therapy faculty member Todd Bourgeois and a team of physical and occupational therapists, including faculty member Dr. Lindsay Perry, spent more than a week providing services to residents of Mizata, El Salvador. Bourgeois and the team offered treatment sessions and gave patients home exercises that they can do on their own. Of the 250 patients they saw, ailments included everything from significant disabilities to aches and pains. The team worked out of a clinic they set up in the town square for part of the trip and spent the remainder of the time visiting homes to treat individuals who could not travel to the clinic. Bourgeois, a three-time contestant on the popular NBC TV show “American Ninja Warrior,” hosted a competition styled after the show earlier this year to raise funds for the trip. He raised $800, which was used to ship medical equipment for the mission. 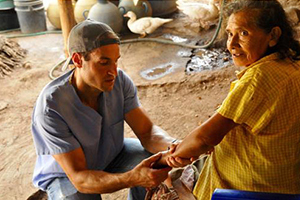 Bourgeois has participated in and hosted several medical missions. Because they are organized through the surfing community, not the university, the missions are always held in coastal locations. “Surfers have connections worldwide in coastal communities,” he says. “We have a team of surfers who want to serve.” The service trips are designed to be a mix of surfing and serving, but Bourgeois says that once on location, most chose to spend the majority of their time serving.